The Spinach Dosa is yet another colourful dosa which will attract the kids for sure. Easy as well as a healthy dosa recipe. I love to incorporate spinach in my cooking as it is nurtitious green leafy vegetable. Here I have not precooked the spinach so the nutrients will not get lost while roasting the dosa. I have made dosa thin and so one need not flip the dosa to get it fully cooked. 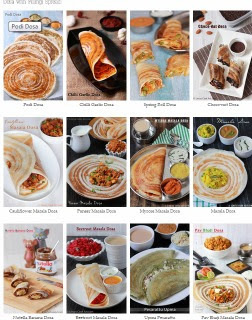 This dosa goes well with any kind of chutney and sambar. Perfect healthy breakfast made in a jiffy, if you have dosa batter inside the fridge. Can not make dosa batter healthier than this. Do try this dosa recipe and stay healthy. Dosa batter, thick- 8 ladle (or) Raw rice- 1 cup soaked for 3 hours to make Instant dosa. In a blender jar add the chopped spinach, ginger, green chillies and jeera. You could replace ginger with 3 cloves of garlic too. Grind well to make a fine paste with little water to grind. 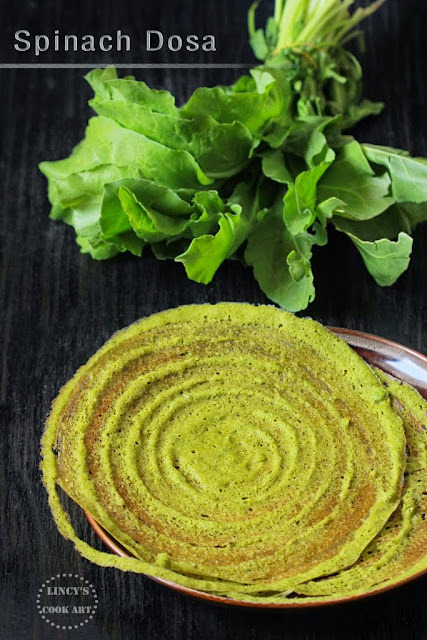 You could grind only spinach and prepare the same dosa if you do not want spicy dosa. You could make this dosa following Instant dosa making procedure too by adding the ingredients while grinding the rice. Now add the thick dosa batter with the spinach paste. Stir well and add salt if required. Heat a dosa tawa and grease with oil; take a ladle full of batter and spread into concentric circles. Drizzle oil on top of the dosa and cook till crispy. Turn the other side and cook if required. Serve hot with any chutney or sambar. Note: Dosa batter should be in idli batter consistency before adding the spinach puree. Healthy spinach dosas... looks so delicious and crispy..